Anyone keeping up with the progress made on NBC’s new show School Pride, and that has a fondness for well designed furniture may have been excited to see Smith System’s furniture being showcased on a recent episode. The school selected for a much needed regroup was Kingston Springs Elementary School. Their Tennessee school was engulfed in flood water in May of this year and suffered building damage as well as the loss of books, technology and school furniture. Volunteers helped unload a substantial gift of school furniture products from Smith System including their new Flavors School Chairs that offer flexible and ergonomic seating in fantastic colors. Interchange Student Desks were brought in to offer a long-term student workspace solution that allow individual study or can be grouped for cooperative learning activities. Teacher’s eager to return to their curriculum, also received new Planner Teacher Desks and files for classroom storage. Founded in 1905, Smith System has helped American education evolve by being ready with the right furniture at the right time. 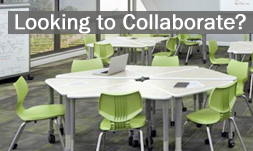 An industry leader in school furniture innovation, Smith System is committed to developing products that support the optimum learning environments — addressing the needs of the student, the demands of the curriculum and the realities of space, maintenance and budget.